As you know, foods containing gluten are right up there next to sugar on my no-no list of acidic foods to avoid. However, there is one major exception. And that’s what we’re going to talk about today: Ezekiel bread. It’s a bread made using sprouted grains that you’ll find in the freezer section of your grocery store (and health food store) or you can make yourself at home. Unlike most breads you can buy, it contains no sweeteners, no artificial ingredients, and no preservatives. The name Ezekiel bread comes from a passage in the Bible where the Israelites are encouraged to make sprouted bread using wheat, barley, beans, millet, lentils, and fitches (or spelt). It’s made in the traditional way of processing wheat that is unlike all other breads available commercially. This is why I can recommend it when I don’t recommend any other gluten products. The modern way of processing wheat leads to all kinds of intolerances, even for those of us who don’t have Celiac disease or a leaky gut. They actually contain something called antinutrients, which means they prevent the body from absorbing the nutrients in the wheat product. So all of that good stuff you hear about whole grains? Your body doesn’t even benefit from most of it because of antinutrients. The great thing about Ezekiel bread is that it returns to the way our ancestors processed wheat, which is called sprouting. 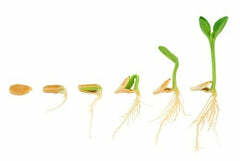 Sprouted grains can be more easily digested by humans and have a significantly lower antinutrient load. So you actually benefit from the nutrients in the grains. Our ancestors were keeping in mind something we’ve mostly forgotten when they made bread – plants with antinutrients can ward off pests because they make them sick. It’s a protective part of the plant. Unfortunately, they have the same reaction in humans as in pests when we don’t digest wheat and gluten products well. Sprouting is a traditional process you can do at home. It involves soaking and germinating just about any type of grain, nut, bean, or seed, as long as it is raw and certified pathogen-free. Anything you consume sprouted will be on average 30x more nutrient-dense than its full-grown adult counterpart, pretty amazing! By allowing the seeds or grains to soak and strain and then produce sprouts, they shed the antinutrients like phytic acid and polyphenols that prevent the grains from being broken down in the digestive process (and out in nature). It’s a complete protein, which means it includes all 9 of the essential amino acids, and a total of 18 amino acids. (For a full list of complete green proteins, check out this blog post.). 2 slices of Ezekiel bread will give you a whopping 8 grams of protein! Your body will absorb vitamins and minerals better when you consume Ezekiel bread because it’s sprouted. It’s a great source of fiber. In fact, it’s much better than most high-fiber starchy foods, including regular whole grain bread. But what about the gluten? As you may know, Ezekiel bread is not gluten free. There are a lot of misconceptions about this, in part because you’ll see experts like me simultaneously saying avoid gluten and Ezekiel bread is okay. Although that seems like a major contradiction, there are very good reasons for that. If you have Celiac disease, a leaky gut, gastroparesis, or gluten sensitivity for any reason, you do want to avoid Ezekiel bread. However, after you’re able to heal your gut, you might find that sprouted bread is the perfect reintroduction to gluten in your diet. For those of us with healthy guts, which the alkaline diet is helpful in maintaining, Ezekiel bread is perfectly fine as part of the 80/20 lifestyle. If you’re trying to lose weight, make it a limited part of your diet. Just like with any ingredients that aren’t completely alkaline, it’s all about HOW you eat Ezekiel bread. Ezekiel toast with a drizzle of Manuka honey, cinnamon, and raw almond butter. Ezekiel toast with avocado, a drizzle of organic extra virgin olive oil, cumin, chia seeds, and sea salt. Optional: jalapeno and cilantro. Ezekiel toast with hummus, sliced tomatoes, cucumbers, and sea salt, black pepper, and black sesame seeds. You’ll find it in the freezer section of your grocery store, since it doesn’t contain the preservatives most breads do. Most stores offer the Food for Life brand called Ezekiel 4:9 but any brand that contains sprouted grains and all organic ingredients should be a good bet. 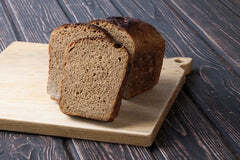 You can also make your own Ezekiel bread or any sprouted grains, nuts, beans, or seeds. It’s important that you read up on the right way to sprout first because it is possible to spread or create harmful bacteria in the sprouting process. It’s also important as you aim for the 80/20 alkaline lifestyle that you supplement with the proper nutrients. This is another reason it’s okay to consume a little gluten, as long as it’s properly processed, like Ezekiel bread. AlkaMind Daily Minerals every night will ensure you’re getting enough calcium, magnesium, potassium, and sodium bicarbonate to neutralize any acid that has built up in your system. 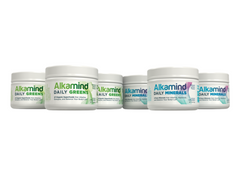 AlkaMind Daily Greens will supplement the essential nutrients your body may be lacking. This IS your new multi-vitamin! Stock up on Daily Minerals and Daily Greens now!